Library and Archives Canada (LAC) provides services to the public at the 395 Wellington Street building in downtown Ottawa where most of the published material and microform collection is housed. One main challenge in serving the public is that the archival material must be transported from five different storage facilities to be available for consultation in Ottawa in a timely fashion. That said, the best solution for avoiding any delay in accessing the records you need is to plan your visit and order the material ahead of time. Also, did you know that there are other LAC facilities throughout Canada? Some buildings are for staff offices, while others are dedicated to the management and preservation of LAC holdings. Let’s begin by exploring the Preservation Centre, which is about 25 kilometres away from downtown Ottawa. Opened in 1997, the Preservation Centre is located in Gatineau, Quebec, and is a building within a building. Its outer shell of glass and steel creates an environmental buffer zone for the interior concrete structure which houses the storage vaults, preservation laboratories and a mechanical plant. The mechanical plant is designed to be separate from, but connected to, the records storage and laboratory facilities. This feature separates and isolates the sensitive laboratory and storage functions of the building. The individual laboratories are constructed in a village-like setting directly above the three-story vault structure. This permits all LAC preservation experts, approximately 70 in total, to work together under the same roof. Storage – Art Vault. 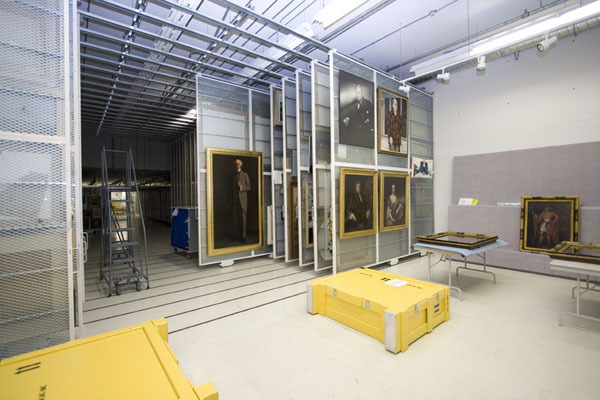 Paintings are stored on mobile hanging racks in an environment of 18 degrees Celsius (+/- 2°C) and 50% relative humidity (+/- 5%). Other multi-media objects stored in this environment include globes and miniatures. The front of the vault provides a work area for collections management activities. There are 48 vaults for the storage and handling of archival records, each of which measures approximately 350 square metres. They house a variety of archival records in four different storage environments. 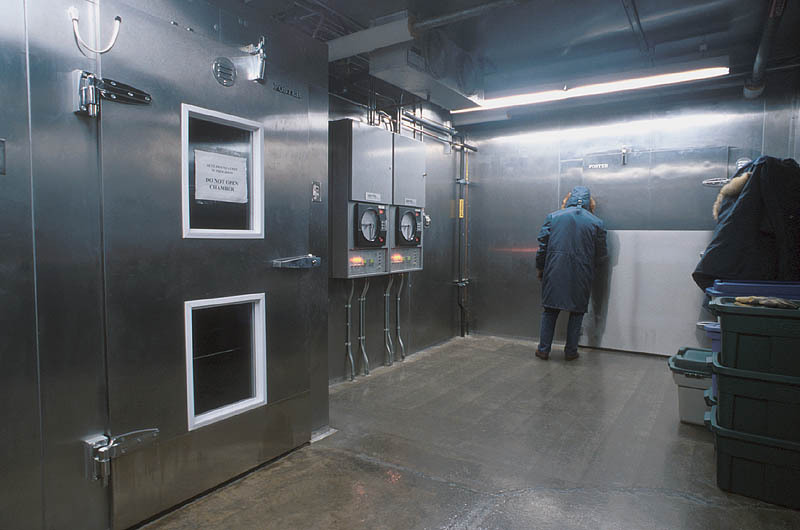 Each vault is designed to protect documents by eliminating potential threats, by having a sophisticated fire detection and suppression system, and by carefully controlling all materials used inside it to maintain a contaminant-free environment. This entry was posted in Our Collection and Facilities and tagged order material, Plan your visit, preservation, services, storage vaults by Library and Archives Canada Blog. Bookmark the permalink.